NOTE: The ribbon cutting has been re-scheduled to Nov. 4 at 4 p.m.
Farmer Doug Jones is famous for growing peppers that thrive in the Piedmont. Lyle Estill is famous for producing biofuel from recycled vegetable oil. The two often trade brainstorms over at the Eco Industrial Park in Pittsboro NC, where Jones runs Piedmont Biofarm, Estill concocts new schemes at Piedmont Biofuels, and food and energy projects often feed each other. Lyle got to wondering if they could grow both food and electrical power at the park, on the same piece of land. What if they erected an array of solar collectors high enough off the ground that food could be grown in the partial shade beneath them? They will soon get a chance to find out, as their solar double-cropping experiment gets underway. Piedmont Biofuels, Piedmont Biofarm and new partners Miraverse Power and Light and Southern Energy Management will have the official public ribbon cutting for the project at 4 pm on Nov. 4 at the Eco Industrial Park. The endeavor consists of an elevated 92.16 kilowatt solar array that will generate electricity above the north field of Piedmont Biofarm, while sustainable produce is harvested at the ground level. The nine-foot clearance of the solar photovoltaic system is designed specifically to encourage growing crops that thrive in partial shade. “Double Cropping is a term we borrowed from the wind industry,” said Estill, noting that wind generators often co-exist with working farms. Michael sits on the Board of Advisors for the Center for Environmental Farming Systems and has a keen interest in both renewable energy and local food. He created Miraverse Power and Light as an entity for the double-cropping project. Farmer Doug has been experimenting with partial shade crops for the past two growing seasons and will be farming beneath the array. “As our agricultural zone changes, there are some vegetables that will benefit from some protection from the sun,” he said. 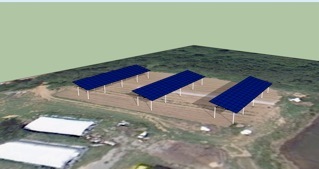 This Solar Double Cropping project represents two years of planning, design, and engineering which resulted in a formal docket assignment by the North Carolina Utilities Commission. Whatever field you go into—business, finance, engineering, transportation, agriculture, education, or entertainment—your experience will be shaped by the energy transition that is now under way. The better you understand this, the more effectively you will be able to contribute to society and make your way in the world. We are at one of history’s great turning points. During your lifetime you will see world changes more significant in scope than human beings have ever witnessed before. You will have the opportunity to participate in the redesign of the basic systems that support our society—our energy system, food system, transport system, and financial system. I say this with some confidence, because our existing energy, food, transport, and financial systems can’t be maintained under the circumstances that are developing—circumstances of fossil fuel depletion and an unstable climate. As a result, what you choose to do in life could have far greater implications than you may currently realize. How to reorganize our financial system so that it can continue to perform its essential functions—reinvesting savings into socially beneficial projects—in the context of an economy that is stable or maybe even shrinking due to declining energy supplies, rather than continually growing. Each of these core problems will take time, intelligence, and courage to solve. This is a challenge suitable for heroes and heroines, one that’s big enough to keep even the greatest generation in history fully occupied. If every crisis is an opportunity, then this is the biggest opportunity humanity has ever seen. Making the best of the circumstances that life sends our way is perhaps the most important attitude and skill that we can hope to develop. The circumstance that life is currently serving up is one of fundamentally changed economic conditions. As this decade and this century wear on, we Americans will have fewer material goods and we will be less mobile. In a few years we will look back on late 20th century America as time and place of advertising-stoked consumption that was completely out of proportion to what Nature can sustainably provide. I suspect we will think of those times—with a combination of longing and regret—as a lost golden age of abundance, but also a time of foolishness and greed that put the entire world at risk. It’s a time when it will be possible to truly change the world, because the world has to change anyway. Making the best of our new circumstances will mean finding happiness in designing higher-quality products that can be re-used, repaired, and recycled almost endlessly; and finding fulfillment in human relationships and cultural activities rather than mindless shopping. Fortunately, we know from recent cross-cultural psychological studies that there is little correlation between levels of consumption and happiness. That tells us that life can in fact be better without fossil fuels. So whether we view these as hard times or as times of great possibility is really a matter of perspective. I would emphasize the latter. This is a time of unprecedented opportunity for service to one’s community. It’s a time when it will be possible to truly change the world, because the world has to change anyway. It is a time when you can make a difference by helping to shape this needed and inevitable change. As I travel, I meet young people in every part of this country who are taking up the challenge of building a post-petroleum future: a 25-year-old farmer in New Jersey who plows with horses and uses no chemicals; the operator of a biodiesel co-op in Northampton; a solar installer in Oakland, California. The energy transition will require new thinking in every field you can imagine, from fine arts to banking. Companies everywhere are hiring sustainability officers to help guide them through the challenges and opportunities. At the same time, many young people are joining energy and climate activist organizations like 350.org and Transition Initiatives. So here is my message to you in a nutshell: Fossil fuels made it possible to build the world you have inhabited during your childhood and throughout your years in the education system. Now it’s up to you to imagine and build the world after fossil fuels. This is the challenge and opportunity of your lifetimes. I wish you good cheer and good luck as you make the most of it. 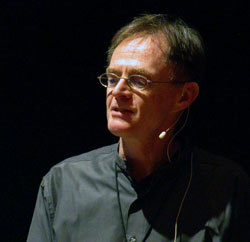 –Richard Heinberg is a senior fellow at the Post Carbon Institute and the author of The Party’s Over: Oil, War, and the Fate of Industrial Societies, Peak Everything: Waking Up to the Century of Declines, and The End of Growth: Adapting to Our New Economic Reality. Excuse me? One can argue all day about how to count food miles and whether or not locavores need to give up coffee and bananas. Dude, if that’s the case, we’re in more trouble than I thought.